Check out this press release from the CN Tower!! 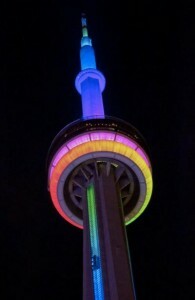 March 7, 2013 (Toronto, ON) Toronto residents and all those within sight of the CN Tower are invited to watch a unique CN Tower light show synchronized to the world première of A Toronto Symphony: Concerto for Composer and City – the first symphony created for, by and about Torontonians. 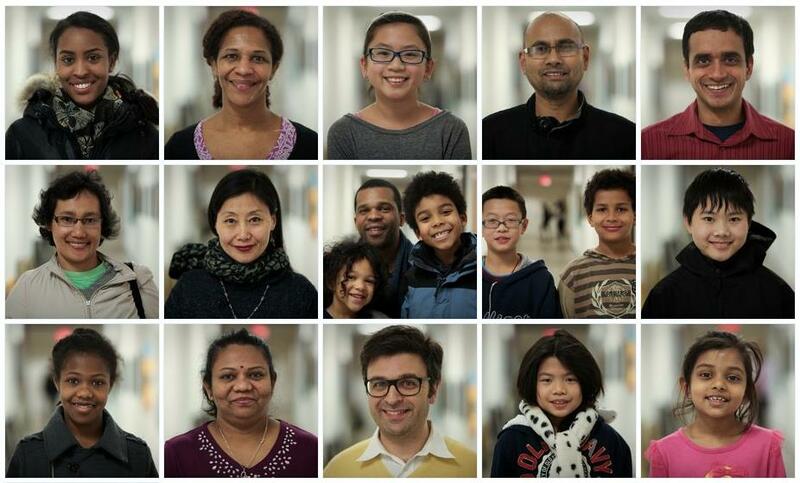 Partial portrait gallery of Torontonians who recorded short stories and comments on Tuesday at the Regent’s Park School of Music, so that their voices can be in heard – literally – in A TORONTO SYMPHONY. I’ll be combining voices and melodies tomorrow; what fun! Come hear it all in Toronto on March 9th (http://tinyurl.com/TodTorontoNC). I have always enjoyed composing harmonic progressions, and the one I have started for A Toronto Symphony is typical of the way I work (see score at right). There is a strong melody line that helps to shape how each chord moves to the next, and how the whole line together creates a story. 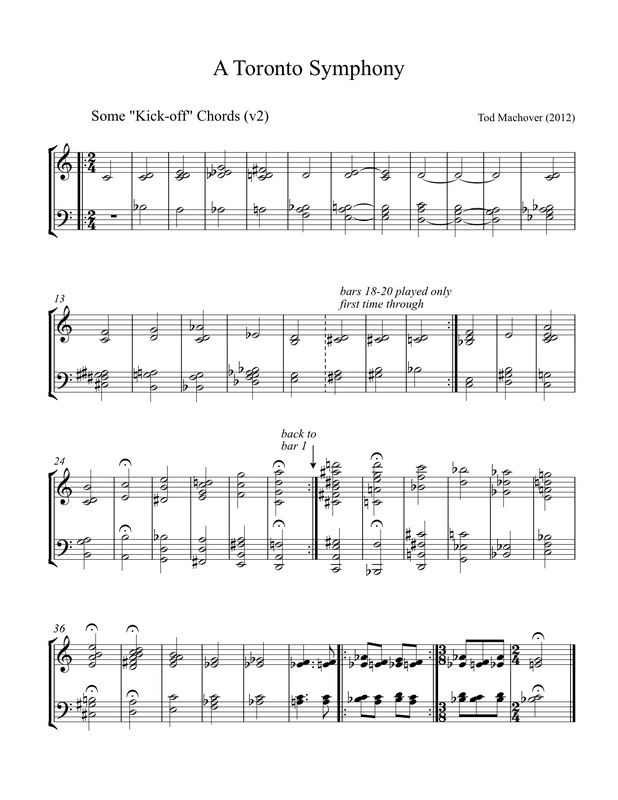 In my music, the bass (lowest) line is equally important…and of course I care about the rest of the notes too. In addition, this chord progression starts and ends simply, but moves in waves, zigzagging from simple/familiar to complex/strange chords, from notes bunched near the center of the keyboard to those spreading from low to high, and from chords which feel restful and resolved to those that seem dense and tense. Sometimes the movement from one chord to the next feels fluid and natural, sometimes surprising. I have tweaked this all fairly carefully, so that the whole progression feels pleasing and complete but also has much variety and potential for further development. 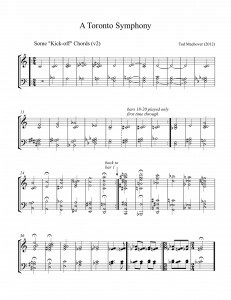 Feel free to download the score and play around with it yourself. Try it on an instrument, add your own melodies, rhythms and variations, and share it back. I’d love to hear what you do with it! We’re starting to get media coverage of our launch. The CBC’s popular morning radio program, Metro Morning, aired an interview with me on June 14. Click here to listen. The Toronto Star has invited readers to send in their “sounds of Toronto” and plans to report on the results. 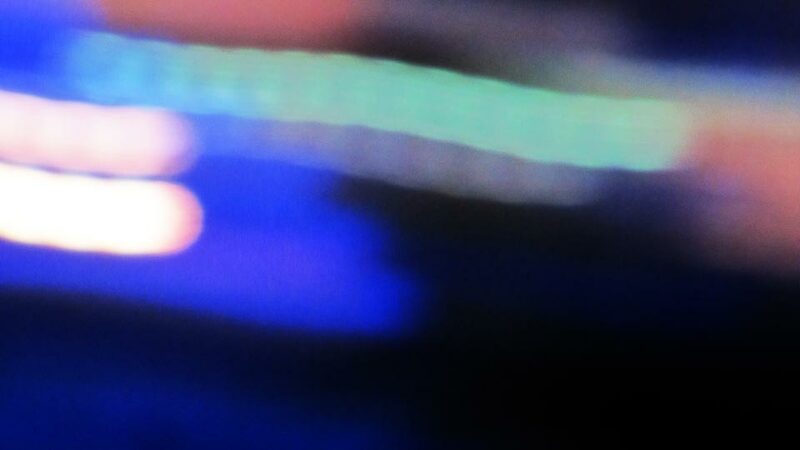 The resulting composition, performed at the official launch at the ideacity conference, built from a scattered, wandering mélange of textures into a series of playful melodies and phases with each instrument taking brief solos. It’s an unexpected, yet pleasing tune that evokes the diverse bustle of a metropolis. Interested in learning more? Post your questions and comments here! Welcome to the A Toronto Symphony project. Over the coming months, I am inviting you – the citizens of Toronto – to collaborate with me to compose a new symphony which will be premiered by the Toronto Symphony Orchestra on March 9, 2013, at the New Creations Festival. Some of the music will be by you, some by me, and some shaped by us together. My hope is that we will create something that neither you nor I could have done without each other, and that will be surprising, stimulating, and beautiful, a musical portrait about – and by – Toronto. Thank you so much for taking an interest. Let’s get started! Connect and collaborate! Our Facebook community page is where we will all share our creations, ask questions, and form groups to collaborate and create new sounds. Share your video of what Toronto sounds like! Share your sound recording of what Toronto sounds like! Most pieces of music have a score, which shows musicians what to play or helps listeners to listen. For A Toronto Symphony, my colleague Peter Torpey and I have created a score which will help us all to compose and to imagine the shape and sections of the piece that we are creating together. This score tells the “story” of the piece, shows what the sections or “movements” will be, and describes the basic way that we will collaborate to make the symphony. Interview by Jennifer Green, Project Manager for the 2013 New Creation’s Festival A Toronto Symphony project. Every March the Toronto Symphony Orchestra presents the New Creations Festival. Season curator and composer, Tod Machover, will create a new work that will be premiered by the orchestra in Roy Thomson Hall on March 9, 2013. The work will be called A Toronto Symphony: Concerto for Composer and City . A unique feature of this project is that Tod will create it with the citizens of Toronto! I had the opportunity to chat with Gary Kulesha, Composer Advisor of the Toronto Symphony Orchestra about the New Creations Festival and how the idea for A Toronto Symphony came to be. I am thrilled to welcome you to join me in a brand new adventure I am undertaking with the Toronto Symphony Orchestra and Music Director Peter Oundjian over the coming year. For the TSO’s New Creations Festival next season, I will be creating a new work that will be premiered by the orchestra in Roy Thomson Hall on March 9, 2013. To be called A Toronto Symphony: Concerto for Composer and City , a unique feature of this project is that I can’t create it without you, the citizens of Toronto! I would like invite you to collaborate with me on the creation and development of this symphony, and to spreading the word to your friends and colleagues to take part as well. The more people who participate, the more likely we will together be able to make a vital musical portrait of Toronto today, and also to propose a new model of how a large community can create something substantial together, a work that is beautiful and sophisticated as well as democratic and inspirational. Between now and early June, I will be regularly updating this website with information about how we can all work together on this new piece, and we will be launching a series of “Musical Journeys” to try a few different formats about how to send music and musical ideas back and forth. I hope very much that you will join us for this grand musical adventure. I truly look forward to collaborating with you over the coming year to make something that will be surprising and satisfying to all of us, not least to the audiences who will listen to our finished symphony.